One of the best parts of SAA Conferences and Leadership Retreats is the opportunity to meet new people and make new friends with others in the Suzuki world who are doing new and exciting things. I met one such young woman, Clara Hardie, at the 2016 SAA Conference. I learned about her passion for extending Suzuki music education and its benefits to children who would typically not be able to have access to it. 1.0 Excellent Suzuki Education is widely recognized, sought and provided to the benefit of all the peoples of the Americas, with reasonable cost-efficiency. We seem to have a pretty good handle on making Suzuki education excellent, but it’s a challenge to see that excellent education widely provided to all peoples with reasonable cost efficiency. Clara has been experimenting with various studio models for a few years now, and has learned a lot in the process. Her innovative practices and policies have enabled her program to provide true Suzuki Education to many students who otherwise would not have the opportunity. I interviewed Clara for this article in hopes of sharing some of what she has learned, and in hopes of inspiring the wider Suzuki community to continue to find ways to make a first class Suzuki education truly accessibility to all students, regardless of their economic or social status. Dan: How did you get your start in the Suzuki world? Were you a Suzuki kid, or did you discover the Suzuki method later on? Clara: I started Suzuki violin lessons at age five in Marquette, Michigan. I have a very clear memory from the Stevens Point Suzuki Institute of standing in a huge sea of kids outdoors in a field, playing through the Suzuki songs. I went to Blue Lake Fine Arts’ Suzuki Family Camp as a child and to Europe with their International Youth Symphony as a teenager. I didn’t become passionate about the Suzuki method, honestly, until I studied to become a teacher at age 26. When I was a kid, it was just there, a fact of life. At the Every Child Can! course, I began really understanding Suzuki’s purpose, its value and how it must have helped form who I am today. What’s your background and training, both musically and generally? I didn’t major in violin performance in college. My major was social science, mixing sociology, psychology, political science, and economics. Ideas I learned from classes like Social Stratification, for example, and concepts like non-violent communication, which I picked up from conferences I attended as a college student, most impact my work today. In addition to the Suzuki teacher training in Books One through Six that I completed with Mark Mutter from 2010–2013, my teaching approach is greatly informed by studies with Detroit Future School’s coordinator Ammerah Saidi in 2012 and 2013. Ammerah facilitated two courses for community educators focusing on popular education pedagogies. I learned how to use “transformative practices” so students would have to use “higher-order thinking skills,” carry the cognitive weight in classes, and develop what Ammerah called “Essential Human Skills,” such as perseverance, empathy, collaboration, and creativity. I found these methods fit perfectly with Suzuki with its emphasis on developing beautiful humanity in addition to beautiful talent. What is Detroit Youth Volume? Describe what the program is like, who the students are, and how it’s evolved over time. 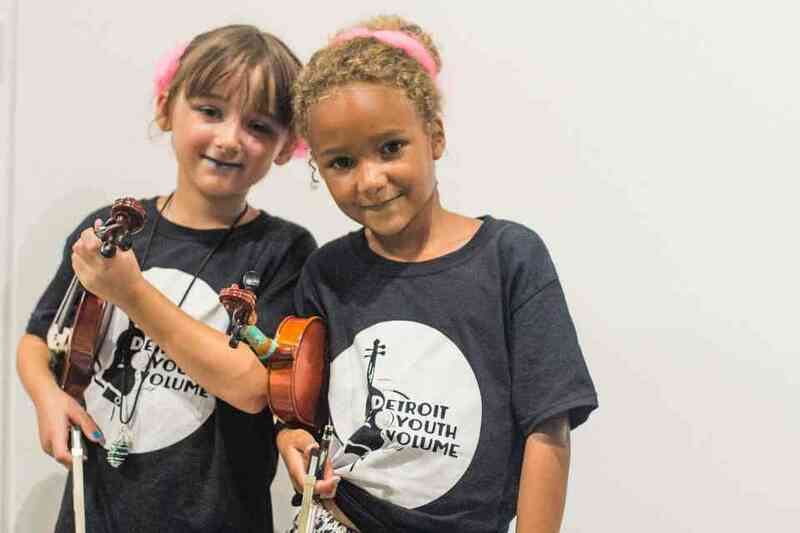 Detroit Youth Volume (DYV) teaches youth ages 3-18 to play classical violin and viola using the world-class Suzuki method through weekly private lessons and group classes. In addition to this rigorous classical training, local artists teach special violin workshops that reflect our city’s rich musical world. Last year we studied hip-hop, and this year we will study jazz. We practice this “place-based education” to develop positive cultural identity in our students as Detroiters. Suzuki teacher trainer Mark Mutter helped a classmate and me facilitate a week-long “Violin Exploration Camp” in July 2010 for eight students at the soup kitchen. Mark’s studio, Suzuki Royal Oak Institute of Music (SRO), then adopted Detroit Youth Volume as a pilot project. SRO parents donated instruments and donated stipends for two of us to provide semi-private lessons (three to four kids per lesson) and group class for 26 weeks of the year. 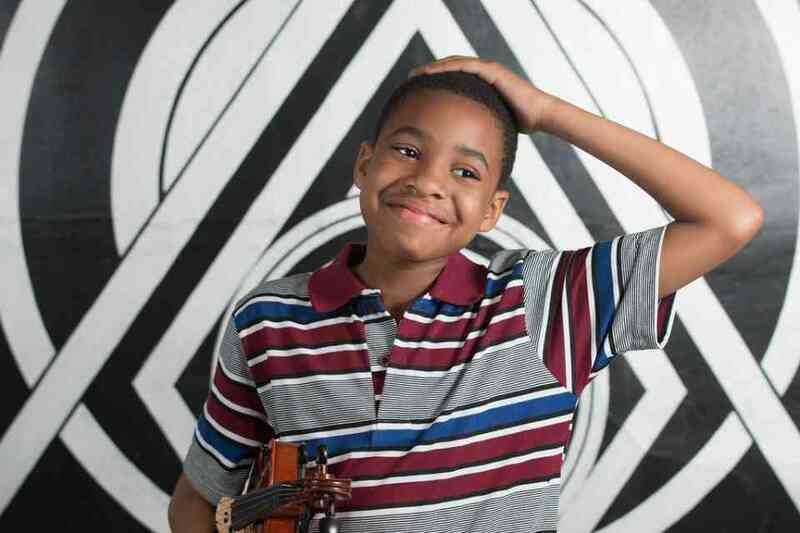 We brought in six new students annually through the intensive Violin Exploration Camp. I handpicked them during the soup kitchen’s three-week Peace Camp, where I taught music. I was able to see which youth showed up consistently, gauge their interest in playing violin, and meet their parents before inviting the family to fill out an application at an info session. I was able to witness success in my child’s eyes; hard work paid off! The CD-making process opened Chase’s eyes to what the future has in store if he continues to stay focused. Detroit Youth Volume not only helps/inspires Chase to be great, it gives me the push I need when I see these kids learning to play music despite some of their circumstances. In 2014, Detroit Youth Volume became independent from SRO as our own non-profit and formed a Board of Directors, which included SRO Director and DYV co-founder Mark Mutter. DYV also signed a contract with Allied Media Projects (AMP) for bookkeeping, staff management support, program evaluation, fundraising, and communications strategy. Having a fiscal sponsor allows me to let someone else manage our online giving page, accept donations, and do payroll, so I can focus on the work of being director and lead teacher. The consultations I receive monthly from AMP are invaluable. In 2015, we won a grant to produce a hip-hop violin album featuring Suzuki songs played to local artists’ beats. This allowed us to hire two new teachers and provide private lessons for each of our 21 students. Last fall, DYV became a music co-op with a mixed-income student body after a couple of grants we were counting on didn’t pan out. DYV cut the number of full scholarship slots and started accepting tuition-paying students. Morphing into a more traditional Suzuki studio model has allowed us to continue to expand what we built using 2015 grant money. Tuition-paying students pay private lesson teachers directly. They pay the non-profit for group classes, which makes group class free for youth from the soup kitchen. We raised our standard of excellence in the process of making the organization more sustainable. Full scholarships were given to students based on attendance records and musical development from the previous year. DYV is not merely a program for low-income families without any expectation of students’ progress; it is a high-quality Suzuki program that happens to offer scholarships. Today DYV serves 35 students. We are expanding the length of our programming to 30 weeks. We currently hold lessons and group class five days a week now instead of two. Another point of growth I’m proud of is moving from donated space to rented space. Having the opportunity to rehearse at Detroit Symphony Orchestra’s education wing exposes the students to professional musicians and other youth who are serious about their musicianship. What motivated you to start DYV? After graduating in 2006, I moved to Detroit. I got a job as a program assistant of the Rosa Parks Youth Program, an afterschool art therapy and tutoring program within Capuchin Soup Kitchen on the East Side. I started Suzuki teacher training with Mark Mutter in 2010 because I wanted to teach violin to kids from the soup kitchen. Dr. Suzuki’s beliefs seemed to run parallel with the social justice values that had been instilled in me by hippie parents and bolstered by my time as a student activist at the University of Michigan. Suzuki’s purpose of bringing joy into the lives of children who had known war resonated with me. Where do you get your funding for DYV? Has that changed over time? ○ A study from the National Philanthropic Trust showed that in 2012, $316 billion was given away to charity. 72 percent was given by individuals, 15 percent Foundations (7 percent given to organizations specifically serving people of color) and 6 percent from corporations. 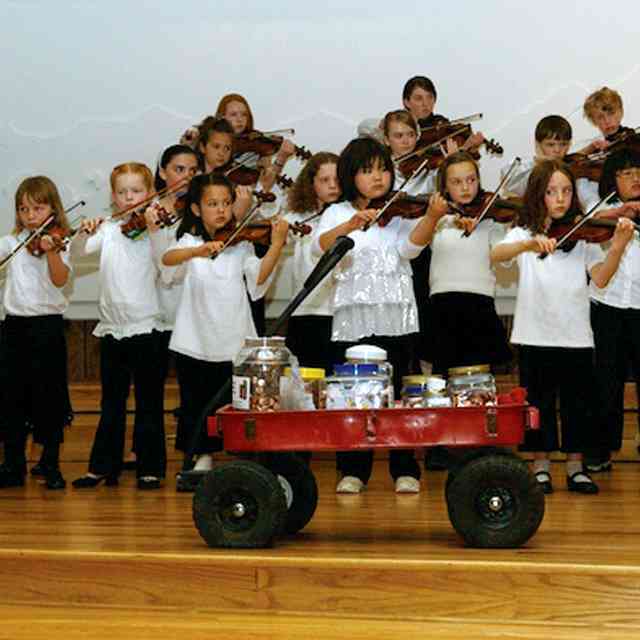 ○ Originally all of our funding and instrument donations came from parents of a suburban Suzuki school. My dream is to make individual donors who give $5 to $50 per month our main source of funding again. 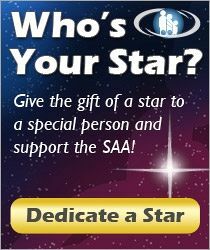 ○ Our donors can sign up to give monthly or just once using our fiduciary’s online giving page. It’s worth the credit card fees and is especially effective for younger donors in their 20s and 30s. ○ When we first separated from Suzuki Royal Oak, our first step was to seek out $500 grants from neighborhood groups like the Optimist Club. ○ Last year we got a larger grant that allowed us to hire two new teachers and offer private lessons. It was a matching grant of $22,000, which meant we had to raise $22,000 on our own to access this money. ○ Our most sustainable funder has invited us to apply twice a year for up to $10,000. The grant agent initially found out about DYV from an article and called my cell phone directly. She invited me to apply and emailed me the application. ○ These are really important for us but hard to predict in budget projections. ○ Recently a group of young suburban artists did an art auction and chose us to receive the profits. A local record store gave us 10 percent of one Saturday’s profits. ○ Last year, we invited a band to perform at our Kickstarter campaign kick-off party. Months later, one of the band member’s mom died. She was also a music educator, so he chose DYV as a donation recipient in lieu of flowers. That was an incredible gift. ○ A friend’s gym gave us a portion of December sales of gym clothing profits this year. ○ We did a Kickstarter campaign last year to raise the match for a $20,000 grant. We raised about $6,000 and half of the donors were strangers! I recommend it, although it does take time to set it up and make a video. I also recommend making all the perks deliverable online, like digital downloads or tickets to a recital, so you don’t have to spend hours and dollars mailing gifts to your donors. Earned-income strategies—use the resources you have to make money! ○ Local performances. Whenever we are invited to play, I have a boilerplate response that includes asking whether there is money for student stipends. I explain that part of our mission is to show the students they can use their violin skills as an earned-income strategy. Often times, we will get $50 to $200. Sometimes I keep it for the organization and sometimes I distribute it amongst the students if it’s a smaller group and a difficult performance time, like a school night. ○ Instrument rental program. This year we started a rental program for our paying students using the fleet of instruments that have been donated over the past six years. We charge half the rate of local violin shops. ○ Our annual event is a violin art auction by giving “violin shaped objects” or instruments and bows beyond repairs to local artists to make into art. Last year, there were 20 pieces and we raised $2,000. Our students played and we sold raffle tickets for people to win things that were donated, like gift certificates to a music store. Another local youth arts group donated a dance performance to the event, which made it even better. A student’s mom owns the gallery where it took place. ○ All of the instruments that we provide for free to our full-scholarship students are donated by families in the Detroit metro area. At first it was mostly from families from a Suzuki studio in the suburbs, from children who had outgrown them. ○ We have two violin shops we rely on for donations of rosin and shoulder rests. They also donate old rental instruments they can no longer use whenever they can. Both of the shops are super small, so it’s a real blessing to have them support us in this way. ○ Rehearsal spaces donated by local churches and community centers have carried us through six years of teaching. We got bumped around year to year and sometimes displaced by church activities. We are paying rent for the first time this year, at the Detroit Symphony Orchestra’s education wing, which provides a lot more stability. Are there both scholarship and non-scholarship students in the program? Do you think this mix of students is an important component of DYV? This year my co-teacher and I invited our current and new tuition-paying students to participate under the DYV umbrella. We realized that there are many levels of income between families who eat at the soup kitchen and those who can afford top-dollar lessons in the suburbs. I believe that social and economic integration is extremely important, which is why at Detroit Youth Volume, everyone receives the same high-quality arts education, regardless of income. It’s important because we can no longer be seen as a program for low-income children; we are now a high-quality program that systematically provides lower-income children the opportunity to participate. It’s important for people to see all of our students thriving, even though they come from different socioeconomic backgrounds. This proves that every child can learn, regardless of race, class, gender or anything else, when barriers to access are removed. I don’t think having mixed income is important to the students because they do not know who is receiving financial aid and who isn’t. Expanding to a broader range of incomes has only slightly changed the racial makeup of the group; the majority of Detroit Youth Volume’s students are still youth of color. Detroit Youth Volume aligns with Allied Media Project’s mission to create media strategies for a more just, creative, and collaborative world. DYV provides an opportunity for young Detroiters to cultivate a critical consciousness through musical expression, while building community between youth and electronic, hip hop, jazz, and classical musicians in Detroit. We are inspired by DYV’s holistic approach in actively engaging parents and students in the learning experience and creating an opportunity for young people who would not otherwise have access to Suzuki methods through minimizing barriers such as transportation, food, and access to instruments. How have your experiences with DYV impacted your perception of economic and racial issues, both in general and as they relate to the greater Suzuki community? My experience with DYV has impacted my perceptions relating to both teacher and student access to the Suzuki method. At my first SAA Biennial Conference, I was very surprised to look around my first workshop and see mostly White and Asian women. In my world, I’m usually the minority in the room when holding my violin. At DYV, I wanted my students to see themselves in their teachers, so when DYV needed to hire more teachers, it meant I was looking for Black Suzuki teachers. I realized there were only two other Suzuki violin teachers in the city of Detroit and all three of us identified as White. These experiences were puzzling and disturbing. One of the teachers I hired grew up in music programs like ours. She was the daughter of Detroit musicians and a violin performance major at our local college. Although she had been teaching violin for ten years, she did not know Suzuki teacher training even existed until she met me. As a college student, she couldn’t afford it. PhoenixPhest Grande generously donated a half scholarship for her Book One Suzuki teacher training. I should not have been surprised but was devastated to hear she felt like an outsider, as the only person of color in the room and one of the only people who was not a former Suzuki kid. Her experiences taught me that the recipients of expanded equity in the Suzuki movement must include teachers of color who want to provide quality arts education, not just students who otherwise would not be able to obtain high-quality arts education. I was encouraged to learn that when the Suzuki method first came to this country, 50 scholarships were provided to account for one teacher per state. What if this happened in 2017 as an intentional move toward diversifying our wider Suzuki community? This initiative would provide support to teachers who would not otherwise have the chance to attend Suzuki teacher training. Scholarship recipients could be chosen using certain criteria that considers the teacher’s demographics and experience. Just as Dr. Suzuki said, any student can thrive when given the right environment. So, we can’t talk about low-income youth benefiting from the Suzuki method without talking about the capacity of their parents. One of the most difficult things I’ve encountered is students having a hard time because their parents are having a hard time. The trauma parents experience in the cycle of poverty as children, and very likely still as adults, can be limiting to their children’s success. I’ve thought about hiring a social worker to come in once a month to assist families in accessing benefits or to help in other ways. Creating a truly accessible program is still a work in progress. Servicing musicians in the Metro-Detroit area, it is really satisfying to see someone as passionate as we are about music grow their business into something very special. Music is part of a shared human experience—one that easily transcends income, culture, and education. The strong, dedicated teachers from Detroit Youth Volume unleash musical potential in talented young people from all walks of life. Not only does this benefit the Detroit area, but the music industry as a whole. What have been your biggest challenges or obstacles to overcome in the past six years of DYV? The most emotional challenge for me was the decision to put a formal standard of excellence in place. It was heartbreaking to let kids go for the simple fact that they wouldn’t be in my weekly life anymore. I had known some of the kids since 2007; they came to my wedding and I went to their birthday parties. I had become so emotionally tied to the families that I was blind to the fact that some of them weren’t progressing and some didn’t even want to be there. I realized that if I just wanted kids to be happy, I could run a drop-in art program. But I want my student’s happiness to run deeper. In the process of learning such a difficult instrument as the violin, I want my students to develop life skills they need to thrive: grit, empathy, creativity, persistence, hope, and the ability to collaborate—but they won’t develop in these areas if they don’t show up, or don’t engage fully in the Suzuki method of practicing daily and see themselves progress because of this. This program is still experimenting with how to make all the benefits of learning Suzuki violin available to low-income families. It’s a balancing act. Reasons for a family’s inability to show up and engage fully in Suzuki need to be addressed with systems of support. Accepting the limits of our capacity to do this is what allows for program sustainability. Other obstacles include maintaining stable rehearsal space and sustainable funding, the learning curve of directing, navigating the nonprofit world, and budgeting. What advice do you have to other teachers who might want to start similar programs in their own studio or community? How do you see the DYV model being replicated in other settings? My advice is to start small. Figure out how funding will look in your first year and envision what it will need to look like when you want to expand. Maybe in the first year you can count on individual donors alone. As you grow, diversify your funding sources; don’t put all your eggs in one basket. Choose your students wisely. Be honest with potential Suzuki families about the amount of work that is required of parents and students seeking the greatest amount of joy. Set the families up for success. It’s more important than ever for low-income students to see themselves succeed in order to develop their ability to have hope; they see their parents try hard all the time and things still don’t work out for them because racism and classism exist in this world. Set yourself up for success. Your program must succeed if it is going to make an impact in the movement for educational equity. Your efforts need to prove that expanding access to quality arts education will make the world a better place. Individual and cooperative studios could easily replicate our program by starting with a small number of full-scholarships. A studio of 30 might choose to make 10 percent of their studio full-scholarship with two or three students receiving fee-free lessons, group class, an instrument, music and transportation support. This could be funded by an annual community benefit or a handful of individual donors who commit to giving monthly. Construct a holistic support system by adopting mentors from different areas of expertise. “Big Picture” values and organizational direction. One of my most valued mentors is a graduate of the Detroit Equity Action Lab, a training lab for nonprofit leaders addressing issues of structural racism by identifying long-standing structural racism and creating action plans to promote change. Suzuki studio. Mine is my DYV co-founder, Mark Mutter, who helps me talk through budget planning, teacher management, and other related issues of running a Suzuki studio. Instrument inventory and maintenance. We have been very lucky to connect with a small basement-operated shop believing that everyone deserves a quality instrument, regardless of income. At a steep discount, they repair violins donated for full-scholarship students. We purchase music books and accessories from them when we have grant money to spend. This shop also helps me go through inventory when I need decide which violins to keep and which to use for the annual violin art auction. Student/parent needs. They are the experts on their own lives! DYV tries to engage in collective decision-making through potluck meetings, surveys and interviews with parents and students. One of the greatest joys in teaching is passing on my passion for teaching and the gifts that the Suzuki Method can give. This is what Detroit Youth Volume is all about. Under the direction of Clara, she has taken the tenets of the Suzuki Method and used them as a vehicle for change in the lives of the youth of Detroit. 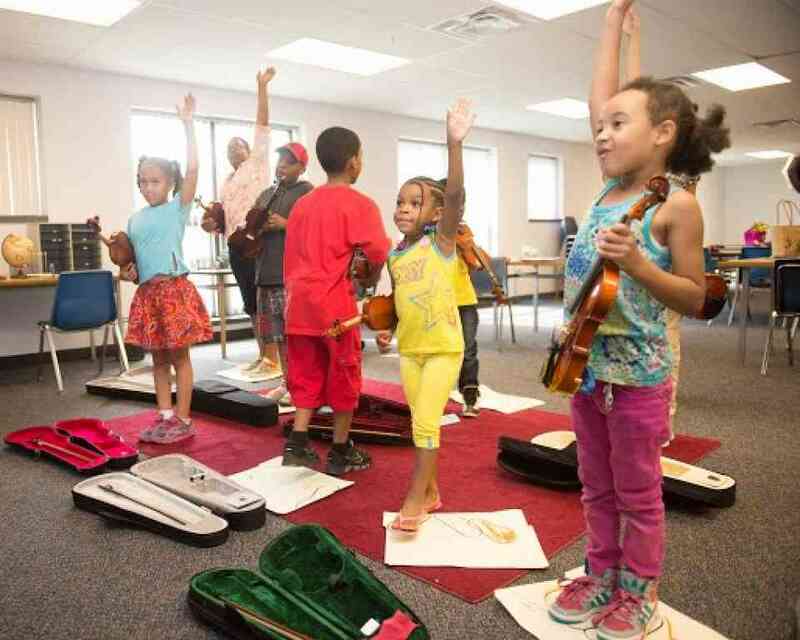 The violin is only a vehicle for the transformative power of music to change young lives, lift up our young ones and their families, and brighten the future of the city of Detroit. How can your experiences with DYV inform the broader SAA community in order to make excellent Suzuki education more widely provided to the benefit of all? DYV has removed barriers to Suzuki training for both students and teachers who would otherwise not get the chance. I hope to spur on the conversation around equity and access in the Suzuki movement by sharing our successes and struggles.